Melodica is the debut EP by American hip hop duo Blackalicious. It was originally released on Solesides in 1994. It was reissued digitally in 2012 with an additional bonus track "Change". Lee Meyer of AllMusic gave the EP 3 stars out of 5, calling it "an admirable effort that gives a glimpse of the group's potential." Nate Patrin of Pitchfork gave the EP a 7.5 out of 10, saying: "This is conscious-minded, lyrically technical underground hip-hop at its rawest and, sometimes, at its most over-the-top ridiculous." In 2015, Fact placed it at number 69 on the "100 Best Indie Hip-Hop Records of All Time" list. ^ Blackalicious: The Spin 25. Spin. May 1999:80. ^ Paine, Jake (July 17, 2012). "Blackalicious To Re-Release "Melodica" EP, Including Bonus Song On July 31". HipHopDX. Retrieved October 17, 2018. ^ Adams, Gregory (July 17, 2012). "Blackalicious Announce New Single, Reveal 'Melodica' EP Reissue". Exclaim!. Retrieved October 17, 2018. ^ a b Meyer, Lee. 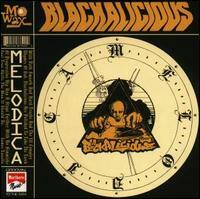 "Melodica - Blackalicious". AllMusic. Retrieved October 17, 2018. ^ Bennun, David. "Review: BLACKALICIOUS - MELODICA". Melody Maker. IPC Media (September 10, 1994): 39. ^ a b Patrin, Nate (August 15, 2012). "Blackalicious: Melodica". Pitchfork. Retrieved October 17, 2018. ^ "The 100 best indie hip-hop records of all time (page 33 of 101)". Fact. February 25, 2015. Retrieved October 17, 2018. This page was last edited on 14 January 2019, at 09:06 (UTC).